fig. 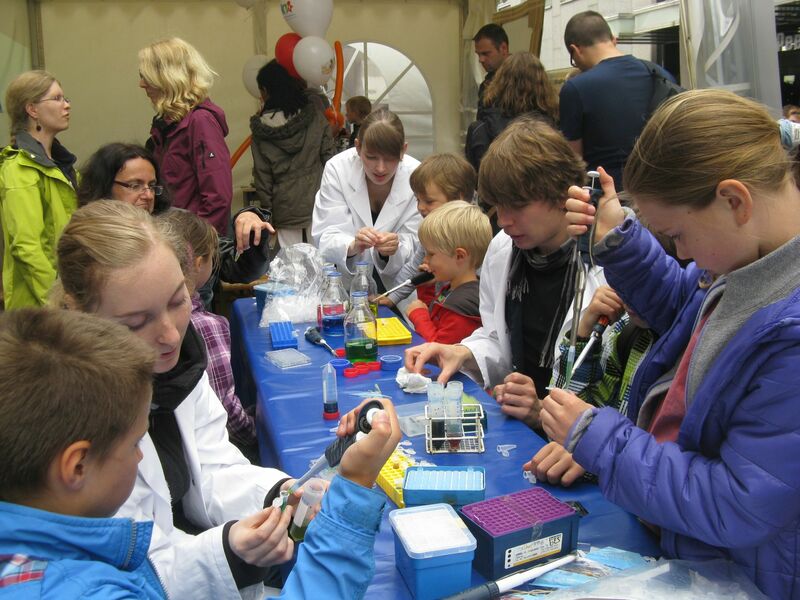 1: Birte Hollmann, Janina Tiemann and Tore Bleckwehl explaining experiments to kids. The NRW-day (North Rhine-Westphalia) took place in the city of Bielefeld, to mark the 800th anniversary year of Bielefeld. The NRW-day is a state feast of North Rhine-Westphalia which was executed every year until 2012 because of the foundation. Not it is celebrated every two years. On the occasion of Bielefelds anniversary it was at our town this year. The feast took three days and had more than 250.000 visitors. For this occasion the president of the Federal Ministry of Education and Research Hannelore Kraft visited Bielefeld. 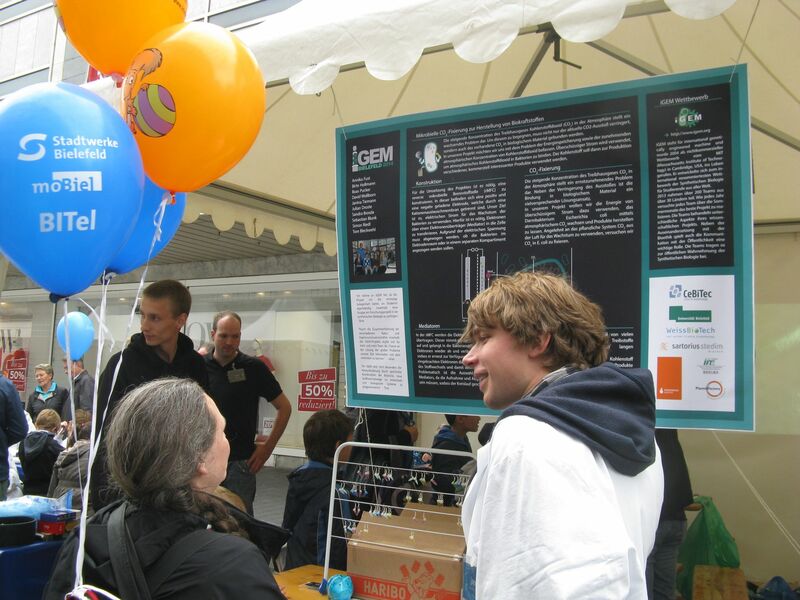 On Sunday, June 29 2014, the whole team organized a stand to promote and inform people about Synthetic Biology, the iGEM competition and, of course, our individual project. 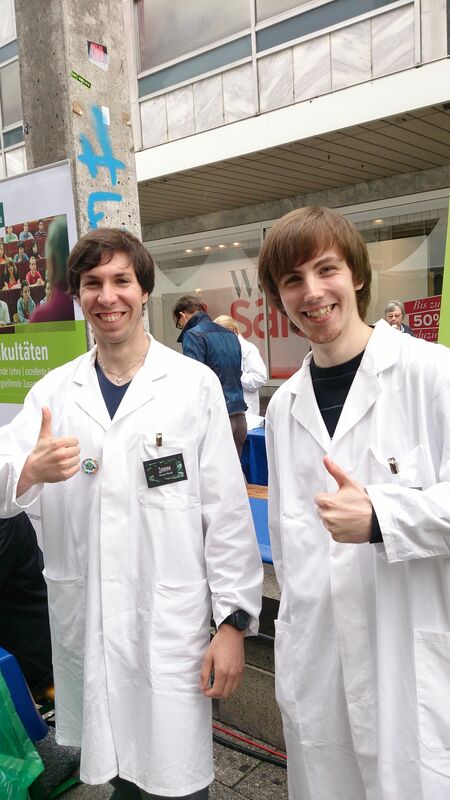 Therefore we offered lots of different experiments for kids and distributed information material. We let the kids use pipettes to mix different kinds of food dye coloured water colored with food dye in well plates and reaction tubes. It conveyed them a first impression of everyday wet labwork. With filter paper and different kinds of felt pens, they were able to do a simple chromatography experiment. A microscope, connected to a projector, enabled our visitors to examine appearance and movement of different microorganisms, like algae wildtype. We guided children through DNA isolation experiments using kiwifruits and simple household materials. With lemon juice we designed "magic ink" and the kids could create their own encrypted message. Beside the experiments we put up posters explaining the basics of synthetic biology and our project. Our team members got in touch with lots of visitors and got in multiple discussions about synthetic biology, genetic engineering and the iGEM competition itself. Most visitors were quite interested and asked lots of questions. In the end our project received a positive resonance. The experiments gave children the chance to get introduced to biological knowledge in a playful atmosphere. For parents it was important to see how much fun their children had, to assuage their fear of synthetic biology. The demand for the experiment protocols were very high, because most of the families wanted to imitate the experiments at home again. Most of our discussions with adults gave them another look on synthetic biology. We were happy about the high attendance along the day.